Thank you to all of my wonderful customers of Pin & Tack! Without you, I wouldn't be able to continue to create and share those creations around the world. I appreciate you all very, very much! This card was submitted to these challenge blogs. See below for details, so you can share, too! This card has such a nice design. I love how you've decorated with the ribbon, and the image looks lovely without much color to it. Spotted your sweet card on MIM. Simply cute! Wonderful colors and layout. 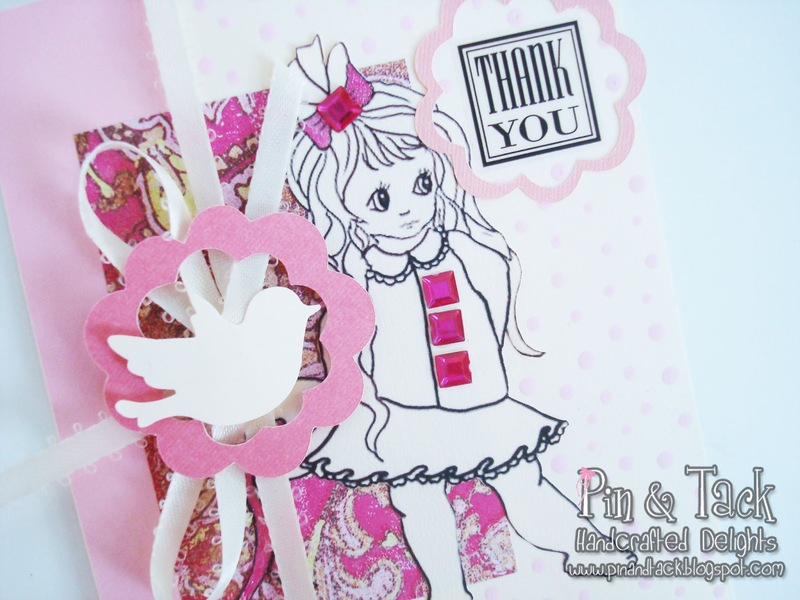 Thank you so much for sharing your wonderful inspiration at 4 Crafty Chicks. This is so pretty, I love the monochrome look. Thank you for joining us at Whoopsi Daisy this week and using a Whoopsi Daisy image. Just adorable! The pink and white just jumps off the page! I am your newest follower! Corinne this is just gorgeous. Love the colours and embellishments. All the elements work so well together. I saw this on MIM and just had to pop over to have a closer look. Hope you are having a fab Thursday. Hop on over to Doing Life - for a chance to win some lovely digi stamps from DS4J to the value of 20$. Such a sweet card. 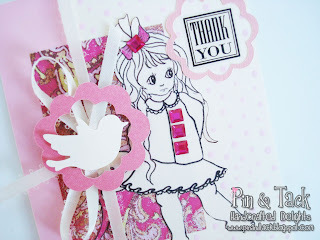 Thanks for sharing with Forever Friends 'Anything Goes' challenge. Good luck in the draw. Adorable card! Cute little girl. Love that you've kept it simple & mono. Pretty card - love the little bird element. Thank you for participating in the Creative Belli Challenge. Love the uniqueness of this beautiful creation! Thank you for playing with us at Whoopsi Daisy this week! Best of luck in the draw! Hope to see you next time!